REDGO Air Mouse, 2.4G MX3 Portable Mini Wireless Qwerty Keyboard Mouse, Multifunctional Infrared Remote Control for Android Smart TV Box IPTV HTPC Mini PC Windows IOS MAC Xbox by REDGO at Apsci Deals. MPN: 172845GC9AU830. Hurry! Limited time offer. Offer valid only while supplies last. MULTIFUNCTIONAL 4 IN 1: 2.4G Wireless Air Fly Mouse + 2.4G Wireless Keyboard + Somatic Handle + Android Remote Control. COMPATIBLE DEVICES: PC, Smart TV, Set-top-box, Network Player, Tablet, Game player, etc. 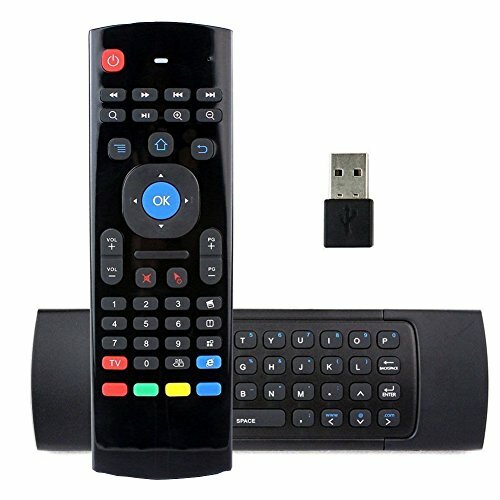 WIDELY USED: Supports for the systems of the Android Smart TV, IPTV, cross-linked set top box, Windows, Mac OS, Lilux, HTPC, PCTV control .Very convinent to view in horizontal and vertical mode for motion games and typing.